Educate yourself about endometriosis and the natural options you can undertake to balance hormones, eat healthier and have normalised periods. Do you suffer with heavy and painful periods? Do you fear your periods because you need time off school or work? Current research shows that over 10% of women have endometriosis and this figure is rising. Endometriosis is an inflammatory condition where your endometrial tissue travels up your fallopian tubes and attached around your pelvic cavity. This “rogue”or “wandering” tissue responds to your monthly cycle as your womb does. This can mean extra ordinary pain when you have your period as this tissue will also shed and bleed. The problem is it deposits into your pelvic cavity and takes a while to be re-absorbed. Medically endometriosis is managed with surgery and the oral contraceptive pill. Unfortunately this only “band-aids” the problem. 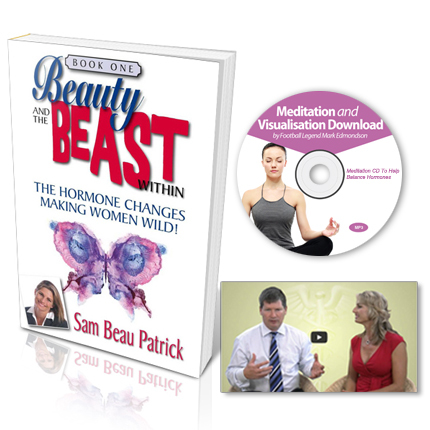 To fix the problem you need to address the issues causing the hormone imbalance, high estrogen, inflammation and more. In my experience it is often due to a combination of events – all of which are best managed naturally. This is a short YOUTUBE clip explaining how you feel if you have high estrogen. The following download is an introduction to how you can manage Endometriosis and will help you decide what your options are and what you can do about it. It is available to purchase now for instant download. A one week eating plan and recipes to go with the eating plan that has gluten and dairy free recipes. Do you send me something? Will this help resolve my endometriosis? According to medicine the only definitive way to diagnose endometriosis is through surgery.